Jet 3Dcart Integration app by CedCommerce synchronizes 3Dcart Store with jet. With the help of APIs provided by jet, the app creates a channel facilitating the synchronization of product inventory and orders, updating product's information and helps you manage the products from your 3dcart store itself. 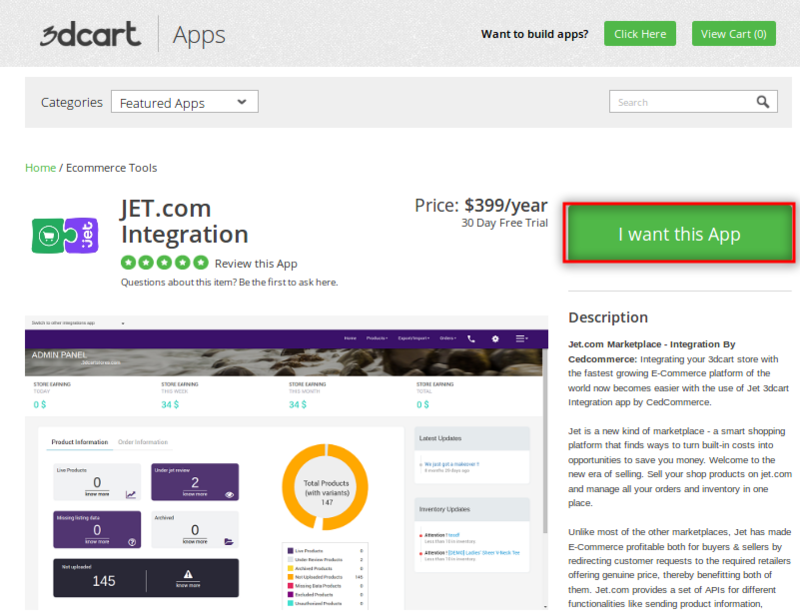 Please follow few steps for adding Jet-Integration app to your store. For installing Jet 3Dcart Integration app, visit Jet 3Dcart Integration & click on "I want this App" option. This will redirect you to the Cedcommerce site. Then click on "Add to Cart" button and ten click on the cart to continue the process. (The app will ask permission for approving the data access of their 3dcart stores using API). Click on Modules on the left panel. Type Rest on the search option within the modules. Rest API app page will appear. There is field for Public key, fill the public key that you had got through the mail. And then click on ADD button. to integrate the app with your store. After complete all the above steps you need to click on Jet 3Dcart App to start the configuration of the app. Note: Remember the shop url and email that you will enter as it will be required every time when you will login to the app. 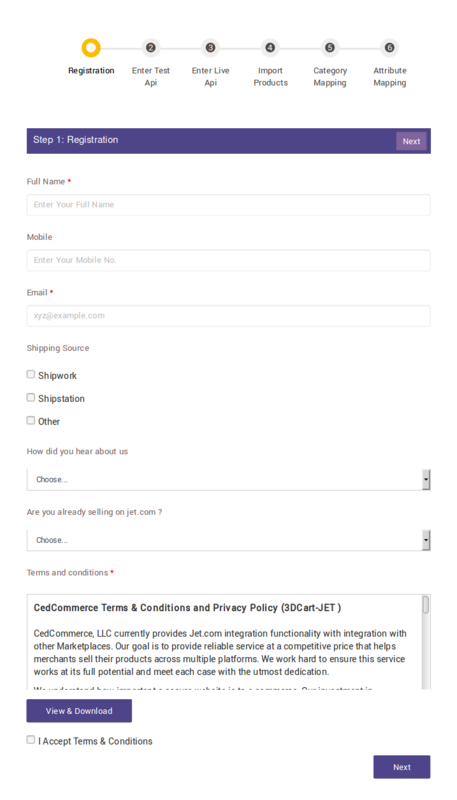 To successfully integrate your 3dcart Store with Jet.com and start selling, few settings are required to be configured. This is the first step after installation of the app. The basic information like your NAME, CONTACT, EMAIL is already filled in that particular section. You just need to choose your shipping source and from where you had heard about us. Then just choose an option that you agree to our terms and conditions. Click next to move on to the next step. 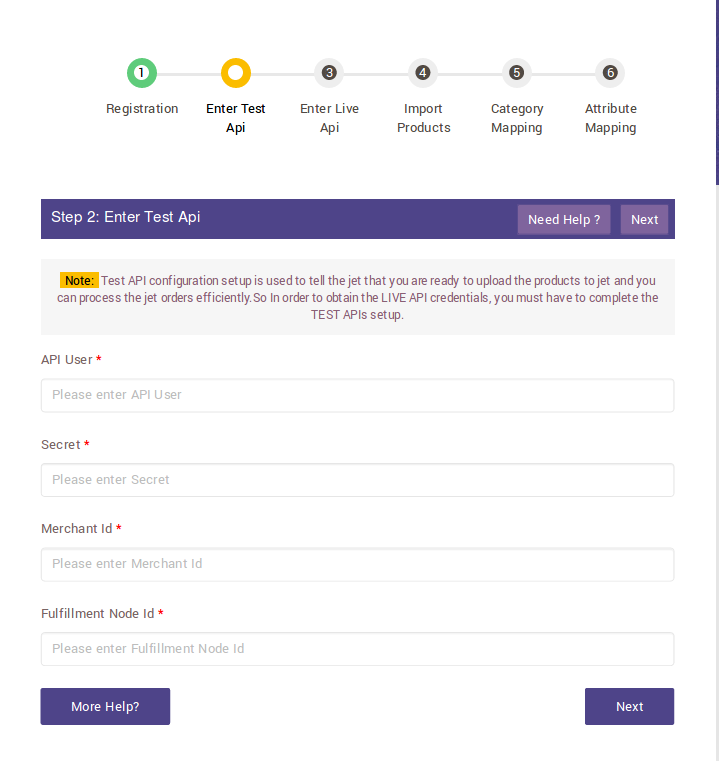 The Jet Integration app configuration process begins with entering the set of API’s – exactly four; API User, Secret Key, Merchant ID & Fulfillment Node Id – which you got from Jet.com into Test Api Setup panel. To get API keys you must have a partner panel on Jet. Just login in your account and get details. Click API (Here you can get 3 (of 4 required) IDs – API User, Secret & Merchant ID)> Copy the IDs> Paste them onto Test Api Setup panel. 3. It’s the time for 4th ID – Fulfillment Node ID. 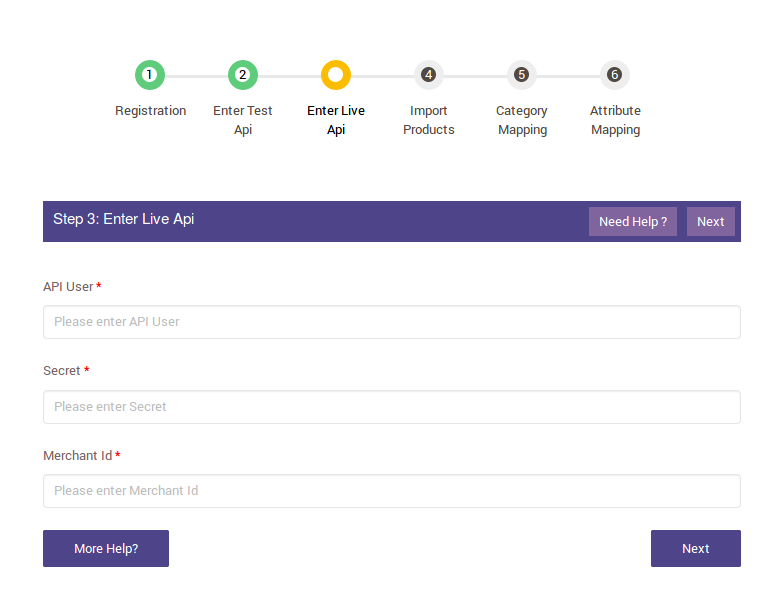 In this Step, you are required to get the LIVE API DETAILS, and PASTE them onto Live Api Setup Panel. Click at DASHBOARD (on Jet partner panel). Here you get API User, Secret, and Merchant ID. Note: Now that you’ve integrated your 3dcart store with Jet.com, you need to import product from your store to the Cedcommerce Jet Integration app. This step enables you to import products to your Jet integration app. All products: It enables you to import all the 3dcart store products in the app. A. Haven't defined Product types for your store products ?! You can define all product types at once with bulk product edit. PARENT -> CHILD -> GRANDCHILD. The chances of getting order increases if you have mapped your product in correct category. 1) Just map your products and then click on NEXT. 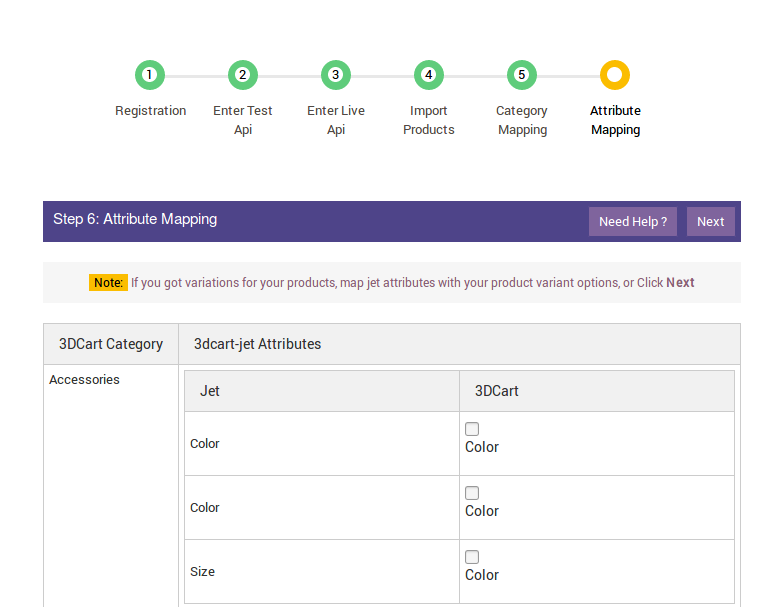 Choose jet attributes that you want to map with your product variant options. 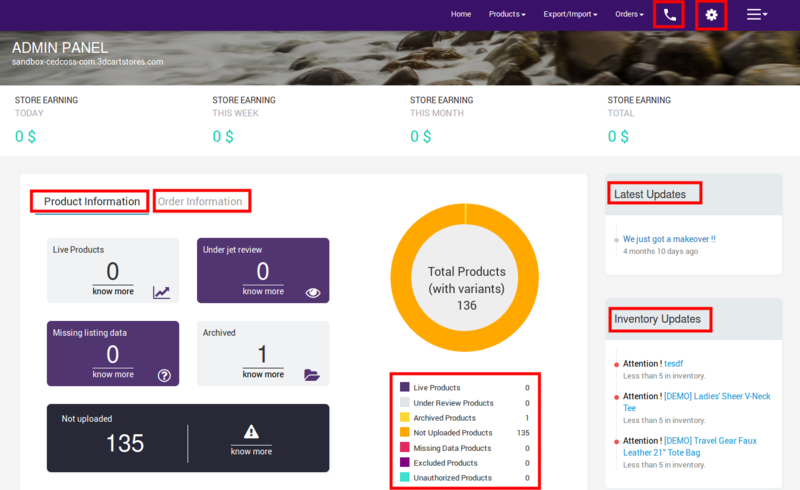 If you have variant products in your store you need to perform ATTRIBUTE MAPPING Variant Products mean, products having various attributes like color, size, metal etc. Map "Size-Free Text" attribute of jet with "Size" variant option of your engagement ring (product type) and jet's "Color" with engagement ring's "Color". We provide various options so that you can contact us easily and always keep in touch with us. You can submit your issue via ticket. You can schedule a call. You can send us mail. You can add on SKYPE with us. Our support is 24*7 available to handle your query. This is one of the most important section of the app. With the help of this section merchant would be able to upload his products and edit the product information if required. This section provides complete product management. Map the products in correct category so that they can sell more. 1) Just map your products and then click on SUBMIT. 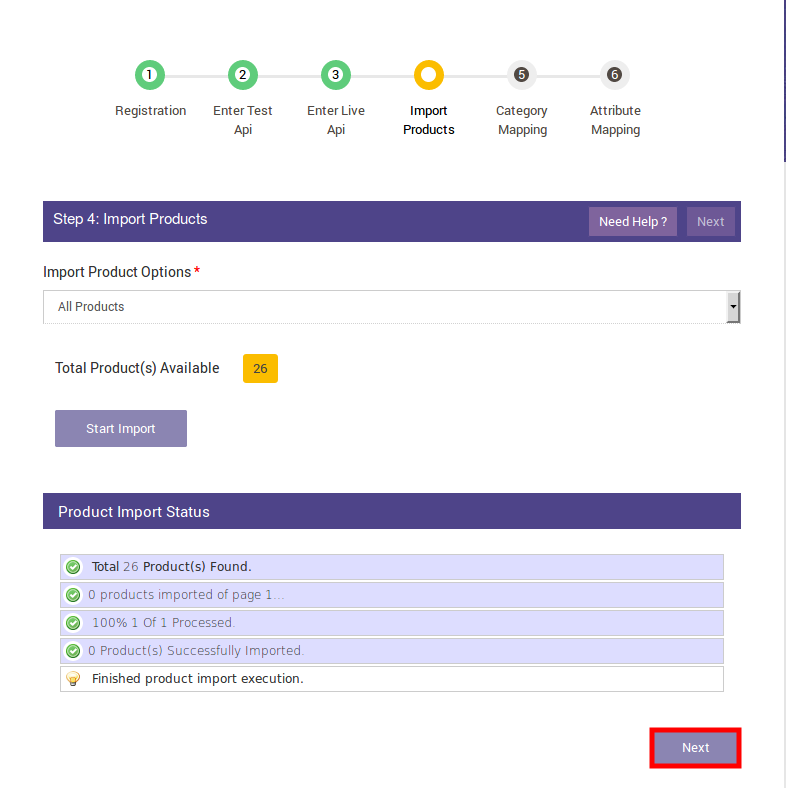 2) After submittion you will redirect to manage products section. 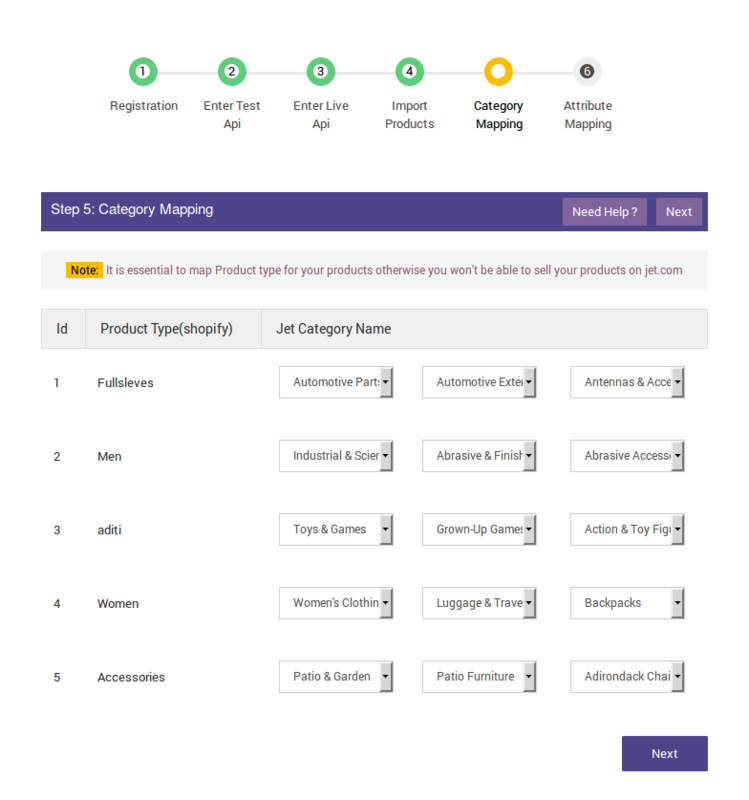 You can search product on jet and then find correct category to map your products. It will be shown that Jet Categories are mapped successfully with Product Type. This is the most important section. With the help of this section you will be able to upload your products, edit your products and many more. Here, you can see all the details about your products also you can edit them. 1. 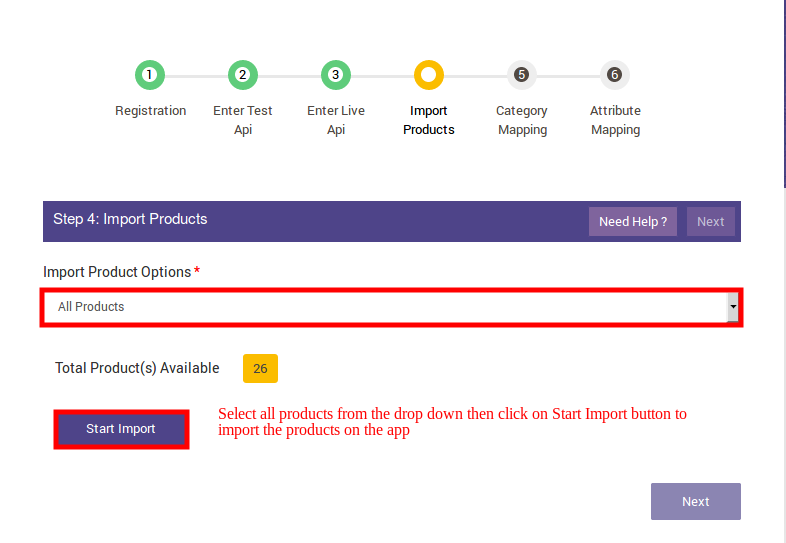 Import New Products- Just click on this option and all the newly created products on the store will be imported to the app. 2. Select and Sync Product(s)- When you click on this button a popup will appear containing the options tht you want to sync from your store. 3. Sync Status(s)- It will update the status of your products according to the jet status. All the products that have valid SKU(s) will be retrieved from 3dcart store. If there is any product with no SKU, it will be not listed on Jet 3dcart app. Each variant must have unique SKU for every product. If any product have duplicate SKU, then it might be conflicting SKU at the product upload time. To upload any products on Jet.com, products must have either Barcode (UPC, ISBN-10,GTIN-14,ISBN-13) or ASIN or MPN(mfr part number) with it. You can add or Update the Barcode(UPC, ISBN-10,ISBN-13,GTIN-14) from 3dcart admin panel’s product section. If any merchant has ASIN then he/she can enter ASIN for each product on EDIT from app panel. Product price must be assigned to each product. You can update product price by admin panel of 3dcart. If you want to perform any changes in your product's detail like you want to update price of products, inventory of products, barcode of products or any onther detail, you can do with this option. Just select the attributes you want to update in your csv and then click on EXPORT. A csv of products with attributes you have selected, will be download on your system. You just need to update the information and then save it. Your updated file would be successfully uploaded on jet. Archive- When you mark your product as Archive, it means it will not be published on Jet. If you don't want to sell your products then you need to archive them. Unarchive- If you want to again sell your products on jet,just Unarchive your products which has been archived previously. With the help of this option you are able to Archive or Unarchive your products in bulk through csv. It will show you message that you had made changes successfully. It will also show you message that you had performed changes successfully. This option provides you the list of those products which are listed on jet. It also provides you the status of those products and also gives you the facility to prform different actions on those products. Export selected sku's csv- You can export the csv of selected skus that you need. Export all SKU csv- You can export the csv of each product. Here you will get the information about your orders. Note: Only the READY state orders will be imported onto Jet 3dcart Integration app. If any new orders are created on Jet.com, they are instantly fetched by our app. Same order is generated for the 3dcart store for merchants, to view details and fulfill them easily in their native order processing system. To view all the imported orders from our app. You can also export csv file of your orders from here. All the failed orders can be viewed from here. If you are not able to complete your order, it will be listed on Failed Order Section. The reason that why the orders is showing under failed order is also showen here. 1. You do not have the inventory for that product in our 3dcart store. 2. You do not have that product SKU in your 3dcart store. We don't fetch orders of those products whose sku are not available on our app. Here all the refunds are listed. Provide us your number and date and choose a time slot at which you want a call from us. 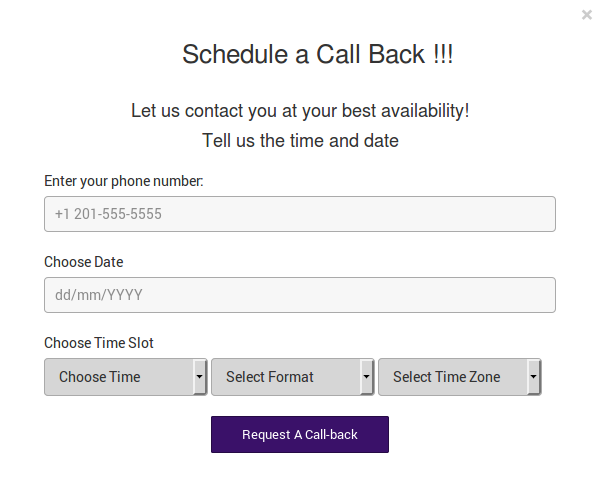 Click on Request a call-back. This will be according to your choice and also we will be always there to help you. With the help of this section you are able to adjust the settings of your panel. Also you can see the details and use various features. You can see your API details from here. These details are associated with Jet.com and provide you a unique identity. These details are necessary for us also . This section contains the details of location from where all the orders will be returned. If customer wants to return the product then he will try to contact on this address. So it is necessary to mention these details very clearly. This section contains the details of payment method you used for complete any order. There are various method of payments like- moneyorder, paypal etc. All the payments method has some integer id. This id would be show in this section. 2. Then click on Payment. 3. Click on "Select Payment Method"
4. If you have already selected any then just hover on Exclude list and if not selected the click on add new. 5. Select any offline method and then click on Add New. 6. After adding the payment method, click on Exclude List. 7. After that you will be able to see the payment method id in the URL of that page. You can add any amount in your all products. If you want to increase price of your products in %age then you can choose this option.